The printing press was brought to England by William Caxton, but Wynkyn de Worde should be recognised for insuring its success. His name suggests he was born in a place called Wörth, or Woerth in the region of Alsace, in north-eastern France. In various records Wynkyn is named as Winandus van Worden, John or Johannes Wynkyn or Wykyn, Wynkyn Vort, and even William Wykyn, though there seems no doubt that Wynkyn was his Christian name, and ‘de Worde’ indicates his family’s origin. He may have accompanied Caxton to England in 1476, although another possibility is that he was brought to England by Caxton in about 1481, to counter the competition of a second printer, Johannes Lettou. Caxton died in 1491 and Wynkyn took over his print shop. There are five known books printed in the first two years, some such as the Golden Legend, being reprints of Caxton’s books, though with modified colophons. Wynkyn’s edition of Walter Hilton’s Scala perfectionis (1494) was ‘sette in printe in William Caxtons hows’ (colophon), and an edition of Speculum vitae Christi (1494) is the first book to refer to Wynkyn by name as the printer. Among the undated books are several romances, Beves of Hamtoun, Guy of Warwick and Robin Hood; the works of John Alcock, bishop of Ely; some curious religious works such as The Doctrinal of Death, The Miracles of Our Lady, The Rote or mirror of Consolation, and The Twelve profits of tribulation. There is also one work of Skelton, The Bowge of Court, a satire on the court manners of the time, and a book which, from the number of editions, appears to have been popular, The History of the Three Kings of Cologne, a translation of the Historia trium regum of John of Hildesheim. He moved his firm from Caxton’s location in Westminster to London at the sign of the Sun in 1500, apparently the first printer to set up a site on Fleet Street, which for centuries became synonymous with printing. He appears to have been the first to build a book stall in St. Paul’s Churchyard (which soon became a centre of the book trade in London), the first to use English-made paper (produced at John Tate’s mill in Hertfordshire), the first to print musical notes with movable type (in 1495 in his edition of the Polychronicon), as well as the first to use an italic font (in 1528 in Lucian’s Complures Dialogi). Wynkyn worked with printers such as Richard Pynson, Julian Notary, and Peter Treveris, they issued many texts co-operatively and exchanged woodcuts, borders, type, and probably text. Several printers started their careers as Wynkyn’s apprentices. There is no evidence that Wynkyn did anything in the way of editing or translating; but he had assistants who were able to translate from the French. Chief among these was Robert Copland who referred to Wynkyn as his former master. Copland also printed several books on his own account, two, at least, being of his own composition. These are The Hye Way to the Spyttell Hous and Iyl of Brainford’s Testament. Henry Watson was another of his servants who translated books for him. In Wynkyn’s will three other printers are identified as former servants: John Butler, James Gaver, and John Byddell; six servants included in the will may have been apprentices, and one servant is identified as a bookbinder. Wynkyn was happy to work with different people and, unlike Caxton, to acknowledge their contribution to his editions. Given the quantity and diversity of the books he published, Wynkyn needed to establish a marketing network. In addition to his links with London printers and bookbinders, trading associations are indicated through his contacts with Hugo Goes, a York printer; John Scoler and Charles Kyrforth, Oxford stationers; Robert Woodward, a Bristol stationer; and Henry Jacobi, Henry Pepwell, and John Gough, London stationers, of whom the first also sold books in Oxford. John Tourner, a stationer, was a witness of Wynkyn’s will. He had servants such as Robert Maas with Dutch names who may have formed part of his links with the Low Countries, and he was in contact with French printers. He had links with leather producers, probably through his own bookbinding activities. He also had a wide range of patrons, who requested books from him. Some are unnamed scholars; others are monks, such as Whitford, merchants, such as Thorney, or nobles, such as Margaret Beaufort. Many scholars assume he was unable to compose poetry, and claim that he employed Robert Copland to write verses for him, but there is no evidence to support this view. Wynkyn improved the quality of Caxton’s product, and is regarded as England’s first typographer. He recognised the possibility of appealing to a broad reading public, and provided easy access to books. Grammar books, popular religious writings and contemporary literature (eg. the poetry of John Skelton and Stephen Hawes) were part of the new materials he made available in print. About twenty of Caxton’s books had made use of woodcuts, but some five hundred of Wynkyn’s books were in some way illustrated; however the quality of book decoration in England still lagged well behind continental standards. He died in 1534/35, and in his long career, was responsible for more than eight hundred publications. c. 1494 The Chastysing of Goddes Chyldern, the first book printed at Westminster with a title page. 1495 Vitae Sanctorum Patrum, The moost vertuouse hystorye of the … lyues of holy Faders lyuynge in deserte … translated out of Frensshe in to Englysshe by Wyllyam Caxton, and Bartholomaeus de Proprietatibus Rerum, an English version by John Trevisa. 1496 Dives and Pauper and The Book of St. Albans. 1498 The Canterbury Tales, a large portion of The Monk’s Tale is omitted. 1499 The Contemplacyon of sinners, written by a monk, William Touris, and an illustrated edition of Mandeville’s Travels. 1502 Manipulus curatorum, by Guido de Monte Rocherii. 1509 The Ship of Fools, The Gospel of Nicodemus, The Parliament of Devils, Richard Cœur de Lion, and several others. c. 1510 A Lytell Geste how the Plowman lerned his Pater Noster. 1510 King Apolyn of Tyre and The Birth of Merlin. 1511 The History of King Ponthus. 1512 The History of Helias, Knight of the Swan. 1519 Dyalogues and Reuelacyons of the Newe Seraphycall Spouse of Cryste Seynt Katheryne of Sene. 1521 The Floure of the Commaundements of God. A translation by Andrew Chertesey of La fleur des commandements de Dieu. 1525 The Rule of Saynt Augustyne, bothe in Latyn and Englysshe. Translation by Richard Whitford. 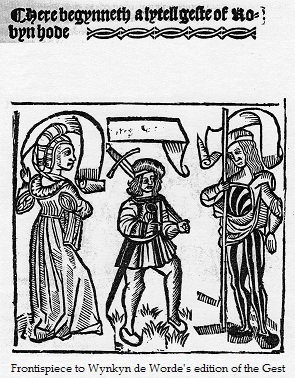 1532 The History of Guystarde and Sygysmonde, translated from the Latin by William Walter. This page contains information found in The Cambridge History of English and American Literature in 18 Volumes (1907–21), Volume II. The End of the Middle Ages, XIII. The Introduction of Printing into England and the Early Work of the Press; Typographic Milestones, Allan Haley, 1992; The Cambridge History of Early Modern Literature, David Loewenstein and Janel Mueller, 2002; Oxford Dictionary of National Biography, N. F. Blake, 2004.